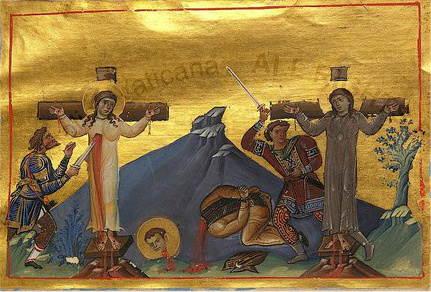 On the eighth day of this month [February], we commemorate the Holy Martyrs and Sisters Martha and Mary, together with the Venerable Lykarion. Martha and Mary are deprived of the light by the sword. Both as a Venerable and Athlete of the Lord. Saints Martha and Mary were sisters according to the flesh, and together they were both consecrated to virginity. One day as the governor was passing by their house, they leaned out of the window and said to him that they were Christians. The governor grieved because of this, and he deplored the death which they would receive on account of their youth. The Saints responded, that death on behalf of Christ is not death, but life, which has no end. The Holy Venerable Martyr Lykarion* confessed the same thing. He was a child monk that was raised by the Saints. At the order of the governor all three were crucified on three crosses. Finally, executioners beheaded them with a sword, and in this way they delivered their souls into the hands of God, and received crowns of martyrdom. * Some believe this Saint Lykarion is the same as the one from Egypt celebrated on June 7th, which gives more details about his martyric feats.